My 1958 Topps #11 Pete Brewster card. The Brewster side of my family tree has come through again with another famous relative, this time a professional athlete. Some time ago I wrote about James Henry Brewster, my great-great-granduncle, who was a well known Kansas contractor and stone mason. James Henry’s other claim to fame was that he happened to be in the First National Bank in Coffeyville, Kansas, when the Dalton Gang had their last shoot-out. A recent issue of the Jay County Journal brought another noteworthy Brewster relative to my attention. 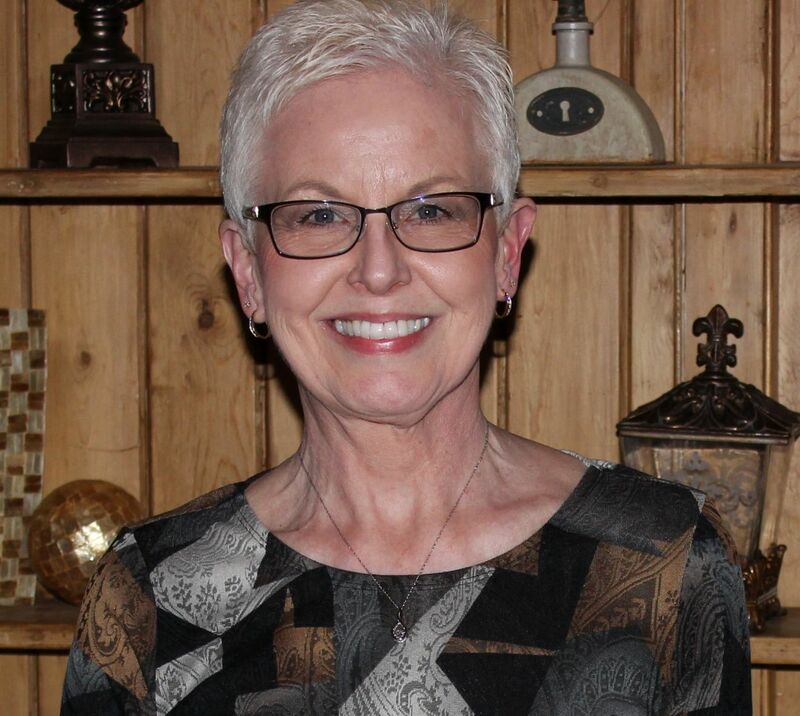 The Jay County Journal is the monthly publication of the Jay County Historical Society, of which I am a member. Darrel “Pete” Brewster, my first cousin twice removed, played professional football for several seasons. Pete Brewster and I both descend from Daniel Brewster. Daniel was Pete’s grandfather and was my great-great-grandfather. Pete descends from Daniel and his second wife, Mary Loverda Bebout, while I descend from Daniel and his first wife, Sarah Fetters. Darrel Brewster was born in 1930 on a farm near Berne, Indiana, and grew up and attended school in nearby Portland. His height helped him become a good basketball player all through high school but he did not play football until his senior year. After high school he attended Purdue University where he played both football and basketball. In 1952 he led the Purdue Boilermakers football team to a Big Ten co-championship, was selected as the team’s MVP and was named to the National College Football All-Star Team. He was a five-time letterman at Purdue and is a member of Purdue’s Athletic Hall of Fame in both basketball and football. After his college graduation Pete was a 2nd round, 21st overall NFL draft choice by the Chicago Cardinals in 1952. But Pete was immediately traded to the Cleveland Browns where he played offense and defense during his first season. During the 1953 season he played first-string offensive left end and was the Brown’s second leading receiver. He was a key member of the Browns’ 1954 and 1955 World Championship teams and was selected for the All Pro and Pro Bowls in 1955 and 1956 at the tight end position. 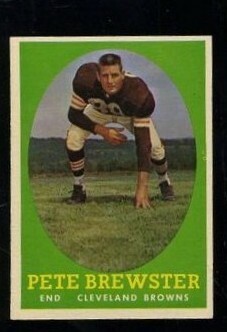 Pete Brewster retired following the 1958 season, after seven seasons (1952-58) with the Browns. But he soon left retirement and played for the Pittsburgh Steelers for two years (1959-60). He then became a coach, first for the Minnesota Vikings and then a receivers coach for the Kansas City Chiefs (1964-1974). During his time as a coach for the Chiefs Pete made two trips to the Super Bowl. The Chiefs were defeated by the Green Bay Packers in Super Bowl I, but the Chiefs beat the Minnesota Vikings in Super Bowl IV. Pete earned a Super Bowl ring for Super Bowl IV. During his active football years Pete was 6’4” tall and weighed 210 pounds. He played for the NFL for 9 years. His career totals include playing in 104 games, with 210 receptions, 3758 yards, 17.9 average receiving yards/reception and 21 receiving touchdowns. His longest reception was 57 yards in 1954. He scored 19 touchdowns for Cleveland, 2 touchdowns for Pittsburgh and fumbled 7 times. His best receiving year was 1954, when he had 42 receptions, 676 receiving yards, with an average of 16.1 yards, plus 4 touchdowns. In 1955 he scored 6 touchdowns for the Browns. Paul Brown was Pete’s coach when he played for Cleveland and Buddy Parker was his coach while at Pittsburgh. 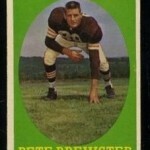 Pete Brewster wore number 83 in 1952, 88 in 1953-58 (Browns) and 88 in 1959-60 (Steelers). Pete is enshrined in the Indiana Football Hall of Fame. In addition, this past summer the Portland High School football field was renamed Brewster Field in Pete’s honor. Pete and his family live near Peculiar, Missouri. Thanks to the Jay County Historical Society for the nice article about former football star and coach, Darrel “Pete” Brewster. The 9 October 2012 edition of Cleveland.com also has an article about Pete, “Cleveland Browns’ 100 best all-time players: No. 68, Darrel ‘Pete’ Brewster”, which includes a video that shows Pete catching several passes. Information from the August 2012 Jay County Journal, Wikipedia and Pro-Football Reference.com. Neat story. Given the current concern of football head injuries and their effect on health, it would be interesting to know how Mr. Brewster is doing. Although most of your stories are about “tombstones,” that does not appear here or any reference to a date of passing. A little math would lead to the conclusion that Mr. Brewster should be about 82 now, if still with us. An age by which many of the types of issues confronting ex-football players should be in full bloom such as ALS, dementia, etc., not to mention the purely debilitating injuries to joints, bones and organs. Is there any current status info. available? I believe he is in pretty good health. According to the Jay County article he was in Portland this past summer when the football field was renamed in his honor. Unfortunately his wife passed away earlier this year. Hello, Karen. My name is Amber, and Darrel “Pete” Brewster is my grandfather. My mother, Debbie, is Darrel and Vivian’s eldest child. I really enjoyed reading your article on Papaw, as his granchildren and great-grandchildren lovingly call him. He is alive and doing as well as can be expected for someone who recently lost the love of their life of over 60 years. I thought I would make mention of his health due to the recent hooplah regarding head injuries and such in football. As with any sports, the possibility of injury was always understood any time you would suit up. It was part of the game. It’s TACKLE football. In the off-season, players had to get “real” jobs to support their families. Anymore, if someone sees a possibility to make some quick cash with a lawsuit, they jump on it…I feel this is the same with the recent head injury uproar. Papaw has had knee replacement surgery and rotator cuff surgery, but it was long after his football career. In fact, his rotator cuff surgery has just been in the last 10 years. He worked construction in the off-seasons and after coaching, so some of the wear and tear could be do to harder manual labor. He is still in very good health, and has had little to no side effects from his surgeries. He and Nana have always been active, and to this day, Papaw keeps an active and busy lifestyle…I believe that this is why he is in overall good health. I love family history, and I really enjoy uncovering the avenues with which I came to be. Thank you for your article! Hello Amber! Thank you so much for writing and telling about your grandfather. I am glad to hear that he is in good health and doing well. I enjoy watching him play and seeing some of his pass receptions on the Internet. How exciting. Do you and your family and Pete usually attend the Brewster Reunion? I am going to make a real effort to attend it this year. Last year the Schumm Reunion was the same day as the Brewster Reunion. The Schumm Reunion is held every other year so I should be able to make it over to Berne in 2013. I would love to meet you and Pete. Again, thanks for writing and let me know if you will be at this year’s reunion. Actually, we won’t have a Brewster Reunion again until 2014. This past summer, we had the reunion outside of Portland at the Hummel (Nana’s parents) Family Farm. The reunion is always on a Sunday, but they started having them every other year several years ago. I would enjoy meeting you as well! I hope that once the details of the reunion are planned, we’ll be able to connect. My husband and I had a visit with Pete last week. We met Pete and Vivian years ago at Silver Dollar City in Branson. Our once a year visit there let us visit with them every year and they became very dear friends. We were heartbroken to hear of Vivian’s passing. We now chat with Pete on the phone often. He is a very dear friend to us and we enjoyed our visit last week. Thank you for writing and it is good to hear that Pete is doing well. I hope to meet him at the Brewster reunion sometime. He sounds like such a nice person. Karen, I wanted to let you know that the Brewster Reunion is this summer on Sunday, July 27th outside of Portland! I don’t if you’ll be able to attend, but I hope to see you there! Thank you for inviting me! Our Miller reunion is that same day, so I will not be able to attend. You mentioned the Brewster runion some time ago and at that time I did not realize there were two local Brewster reunions. The Brewsters from the Berne/Geneva area (my grandma Brewster’s side of the family) have their reunion the first Sunday in August. As I understand it, your side of the family meets every other year in July. I was thrilled to get to talk to Darrel Pete Brewster on the phone last night! Such a nice man to talk with and we plan to meet in July. I will be nice to meet him in person. Thanks for writing! Karen , I am Darrell Brewster’s nephew. My grandmother did indeed hate football. My Mother Esther signed the permission slip for him to play high school football without her knowing. I can remember being at grandmothers on a Sunday watching a football game on t.v. and the person yelling for a team the most was my grandmother. There are many stories to be told over and over again. I would like to invite you to our reunion at our home in July. You are more than welcome. Reunion Date is 7/27/14 at 12:00. Thank you writing and sharing the story about your family. So interesting! And thank you for inviting me to your reunion. I would love to attend and meet your family, but that is the same day as our Miller reunion! The Brewsters in this area still have a reunion at Berne, Indiana, the first Sunday in August every year. Unfortunately this year that is the same day as the Schumm reunion. Great to hear from you. So glad you wrote. The Green Bay Packers won Super Bowl 1, not the Chiefs. Also Pete Brewster won national championships before the Super Bowls, but they in fact did not get a big fancy ring, but they received something from the NFL for their wives. Just a little more info for you! Oops! I had that reversed. I even watched Super Bowl 1 and was a Green Bay fan back then. Thanks for catching that.